I am 34. I am 34. I am 34. Oh sorry, just trying to get used to it. Sometimes I feel 12 (most of the time I feel 85). This is from my birthday this past Sunday. Just a quiet day at the dog park with my family. Impractical outfit with practical shoes. Sort of a metaphor for the balancing act that is my life. It's intentional that there's not a whole lot of deep meaningful, or serious content here. For me the internet is not the place for it. That's what real life is for I guess. There are times though, throughout the year that I do get sentimental or downright pensive, usually around holidays or this here birthday. I never would have imagined my life would be as it is now, ten years ago. Probably not even two years ago. I try not to think about it too much. It stops me dead in my tracks and ain't nobody got time for that! Gotta keep it moving. You just have to try to be thankful for what you do have and work harder to fill in the rest of the blanks. You don't look 34 at all, more like 24! I love how much you love Céline! Super cool style, I'm a Philo-phile too! Happy bday btw, mine's tomorrow!! How close! Btw, I just posted my new outfit post featuring peeking florals from Céline and layerings, hope you'd be PROVOKED! Then Happy Birthday (a little late)! I love this outfit, so beautiful! I just turned 34 some days ago too, so I know how you feel! I feel ancient when I see most bloggers. You look like you could be 24, so you shouldn't feel old since you look super young. Like you, I still feel 12 most of the time, I don't feel my age, I still feel like in my early 20's and nothing has changed much, except I am wiser in many other ways and feel much more comfortable and happier with myself, unlike in my early 20's where I was so insecure of myself and hated almost everything about me. How I love the matching top and pants. Happy birthday! Happy Birthday! Celine suits you so well. I don't know where you took these pictures but I'm going to pretend you're chillin in Tom Ford's ranch. If you are not going to wear your birthday suit on the big day (probs unacceptable past the age of 3) Celine is def the way to go. Happy belated Birthday! You look exceptional beautiful! Loe the outfit! Wishing health and prosperity! 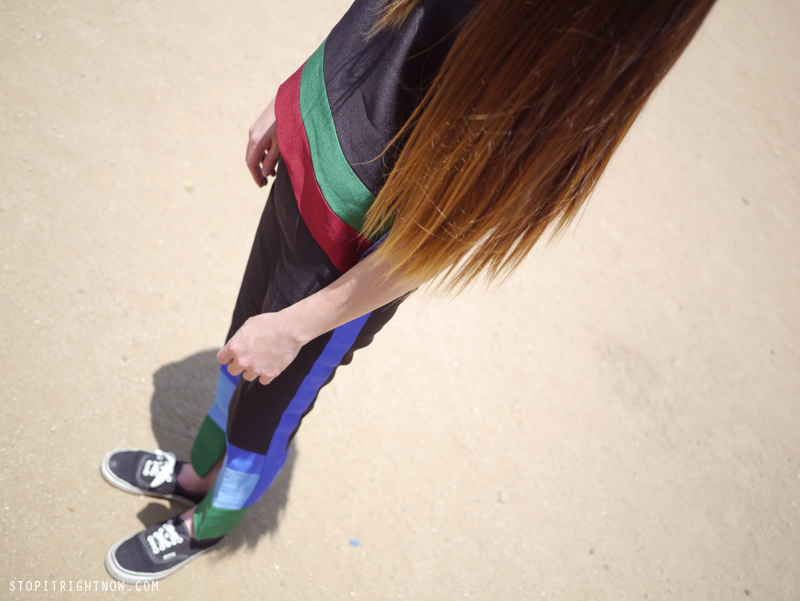 Love this sports-luxe color block combo! Pretty cool look! Love the beautiful outfit!!! Happy belated b-day! Looking so chic for 34! Happy Birthday one of my fav bloggers. You look exceptionally amazing for 34. Here's to good health, love from your family and happiness. Cheers! Happy birthday! You really do look ten years younger. Wish you lots of success and happieness! And the look is just awesome! I like how stylish and clean you look in all that designer stuff. Gurl, keep on moving. Also, this. This outfit. Your hair! Everything! Happy belated birthday. 34? You don't look a day over 24 ;). You are absolutely fabulous and I hope you had a wonderful birthday. I only hope that I can be just as awesome at 34 as you are. Sick outfit, and you have the coolest laid back attitude and a sense of humor to add. dont know if we're just soul mates or what but do you also find it hard to keep your left shoelaces tucked in ? Impractical outfit with practical shoes, just fell in love with you. It's nice to see your site. I am sure that I will be a daily visitor of your site.